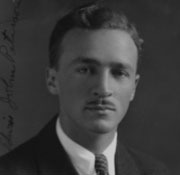 Born December 25, 1907 in Sweden, architect Edwin John Peterson came to the United States as a small child with is family in 1913. He grew up in Spokane and attended North Central High School before moving to Pullman to attend Washington State University. While there he was heavily involved in the ROTC program and served as the President of the Society of Military Engineers. He graduated with a Bachelor’s degree in architecture in 1931, graduating Phi Kappa Phi. As a top student, Peterson decided to continue his studies at Harvard in Cambridge, Massachusetts on a full scholarship. Under the leadership of dean George H. Edgall, and teacher Jean-Jacques Haffner, Peterson received a broad architectural education with an introduction to the new European Avant-garde styles, city planning and landscape architecture. He completed his Master’s in architecture at Harvard in 1933. Upon graduation Peterson returned to Spokane and went to work for the top architectural firm in the city, Whitehouse & Price (1933-35). Gaining valuable experience, he decided to open his own independent firm in 1937. One of his first projects was a modest, but highly detailed home for J. Orville Westberg on Spokane’s south hill (1937). The home was touted in the local newspapers as an “attractive conservative-modern style dwelling.” Another early project was the Nelson Greenfelder House (1938), which was noted for its “Modern Trend” in kitchen design. A home for T.L. Shannon (1940) also received a fair amount of press for its unusual design and brickwork, however it was Peterson’s design for the Spokane Better Housing Committee in 1940 which put his work on the map and began a push towards modern design in the previously conservative architectural community. The modern, but modest International Style dwelling, also signaled a shift in Peterson’s designs from traditional to contemporary. Peterson had actually been awarded the commission as the result of a design competition in which he won first and second place, among a group of ten local architects. With an active interest in aviation, a pilot license, and military training during college, Peterson was a prime candidate for being drafted during WWII. He served in the US Army Signal Corps (1941-46), rising the rank of Captain and was initially stationed at Fort Monmouth, New Jersey and spent time in Puerto Rico, Europe and the Pacific. After the war, Peterson returned to Spokane and continued his independent architectural practice. Among his during the second phase of his career was a modern two-story, flat roofed home in Pullman that was featured in the Pacific Northwest Book of Homes (1947). Other designs included the Elks Temple (1948) in Coeur d’ Alene and Moscow; the Hillcrest Manor Apartments (1949); David Bemis School (1949) in Spokane; the Idaho Compensation Co. Office in Coeur d’ Alene (1949); the Ritzville Methodist Church (1950); and Salem Lutheran Church (1950) in Spokane. All of these designs boast a pure modern aesthetic of clean lines and a use of modern materials. During this time Peterson became active in the local chapter of the AIA, first serving as secretary (1939-41) then President (1948-50). His work during the war afforded him the opportunity to be appointed as a member of the National Capitol Planning Committee in 1950. In 1951 he was recalled to the Air Force and was initially assigned to handle various building projects in Korea. After serving as a technical advisor on housing to the Secretary of the Air Force in the Pentagon for four years, Peterson retired as a Lieutenant Colonel from the Air Force Reserves. He then became the Chief of the Architectural & Urban Planning Division of the State Department; overseeing $200 million dollars worth of housing projects scattered across the globe. Projects ranged from working to rebuild housing in Spain, to directing the modernization of Vietnam. In a 1970 Saigon ceremony, Vietnam’s President presented him with the Chuong My Merit Medal, 2nd Class, in recognition of his achievements as project manager of a 2,000 unit housing project. During his time overseas, Peterson worked with several engineering firms on projects in France, Pakistan, Central American, Turkey and Iran. For many years he was based in Tehran, and traveled extensively. Reportedly he created a master plan for several Army bases in Iran as well as helped design Atomic blast-resistant structures in Paris. From 1962 to 1964 Peterson and his family lived in Lahore, Pakistan where he was asked by the state to set up a design center to train Pakistani architects and engineers. While there he prepared standardized plans for primary and secondary schools as well as colleges. He also went to Greece for a short time in 1963 to supervise the construction a new air terminal in Athens and a university. After spending five years in the middle east, Peterson took a new assignment in Nicaragua in 1965. While there he oversaw a variety of projects. He retired from the State Department’s Agency for International Development in 1975. Despite his extensive oversea travel and work, Peterson continued his connections in the Pacific Northwest and maintained homes in Spokane and Newman Lake. Between assignments he often returned to visit family and friends and while in the city, he and his wife lectured about their travels to a variety of service groups. One of the many skills Peterson acquired on his extensive travels was his understanding of languages. He was fluent in Swedish, French and Spanish and had a working knowledge of Persian. Over the course of his career, several of Peterson’s designs received national recognition in a variety of architectural publications and he was listed in Who’s Who in the West and Who’s Who on the Pacific Coast; biographies of important individuals. Upon retiring in the mid 1980s he returned to Spokane where he passed away on June 8, 1991 at the age of 83. “Modern Features Seen in Westberg Home Plan” Spokane Daily Chronicle, March 23, 1937. “Modern Trend Brings Kitchen Attractiveness Into Balance With Rest of Home” Spokane Daily Chronicle, July 21, 1938. “Peterson, Ritter In Charge of Meet” Spokane Daily Chronicle, June 23, 1948. “Shannon Builds Unusual Home” Spokane Daily Chronicle, March 30, 1940. “Speed Building Model Home” Spokane Daily Chronicle, March 27, 1940. “Architects Name Edwin Peterson” Spokane Daily Chronicle, May 7, 1941. “Sprawling Home” Spokane Daily Chronicle, April 25, 1951. “Architect Visits Spokane, Family” Spokane Daily Chronicle, April 12, 1962. “Chroniscope” Spokane Daily Chronicle, August 6, 1964. “Central America Is Next Assignment” Spokane Daily Chronicle, June 25, 1965. “Rockwood Garden Club Meeting Set” Spokesman Review, March 14, 1966. “Homey Scenes Are Featured” Spokane Daily Chronicle, February 15, 1968. “Spain Said Big Opportunity for U.S. Money, Know-How” Spokane Daily Chronicle, February 6, 1957. "Plan NW12” Pacific Northwest Book of Homes, 1947. pg 30. “Share Close Call When Plane Drops 2000 Feet” The Spokesman Review, April 9, 1940. "Prize Competition House Opened" Spokesman Review, June 30, 1940. "$400 Display Dwelling Ready” The Spokesman Review, June 30, 1940. “Renowned Architect Dies at 84” The Spokesman Review, June 11, 1991. “Officers Installed by Architect Group” The Spokesman Review, December 11, 1948. WA State Architect License – TL 191, December 12, 1935.